What’s Small, Agile, Fast, and at the Olympic Games, but Not a Gymnast? When athletes are injured, a fast and precise diagnosis is key. 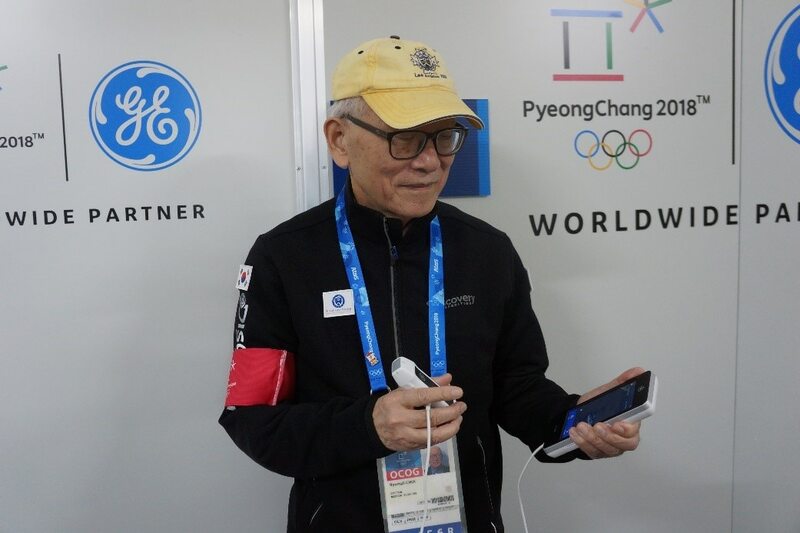 This was a priority for Dr. Hongjin Shim, the second head of PyeongChang Mountain Cluster Polyclinic at the Olympic and Paralympic Winter Games PyeongChang 2018, where he established the polyclinic system and management structure as well as the emergency department. In the emergency room, Dr. Shim is particularly focused on examining ‘lung sliding’ between the lung and chest wall (pneumothorax) and fluid collection that is trapped in the pleural space (hemothorax). “The abdomen and chest usually get examined with sonography in the emergency room. When there is an accident, we need to identify any damage or bleeding in the abdomen and chest for the first time, because there are many vital organs in the chest and abdomen,” Dr. Shim explains. He recalled an athlete who was suffering from chest pain and left abdominal pain due to an accident during training. Dr. Shim needed to examine whether there was a problem such as spleen rupture, hemothorax, or pneumothorax in the chest-abdominal space. Fortunately, there weren’t any. Orthopedic doctors have also been using ultrasound to identify bone fractures and ligament defects. An athlete came into the polyclinic with a knee injury, and the orthopedic doctor used the Vscan Extend to examine the knee joint. He found that there might be a lateral ligament injury, and sent the athlete to a local hospital for an MRI scan so they could provide the appropriate care as quickly as possible. The portability makes it excellent for emergency medical teams who need to travel to the site of injury. Even National Olympic Committee (NOC) team doctors, many of whom are orthopedic surgeons, are using it to look at their own athletes. For clinicians to make a confident diagnosis, image quality plays a crucial role. “I was surprised at the image quality of Vscan Extend, especially for a portable, pocket-sized device that resembles a smart phone,” Dr. Shim commented. 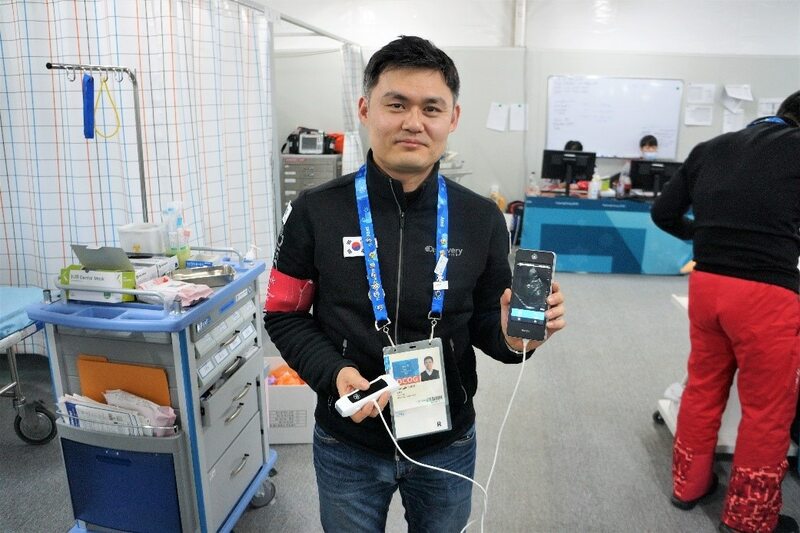 Dr. Bill Choi, a general cardiologist at Medical College of Wisconsin with a special interest in integrated cardiac imaging, who was serving as a cardiologist at the PyeongChang Mountain Polyclinic, echoed the benefits of handheld ultrasound. “For an experienced clinician like myself, I can listen to the heart with a stethoscope and give a diagnosis, but in order to find out more information or determine whether the patient needs surgery, I rely on this device,” he added. Valid for systems with DICOM configurations. Valid for systems with Wi-Fi configurations.